“Keep Calm and Carry On” is still currently a huge internet meme.. 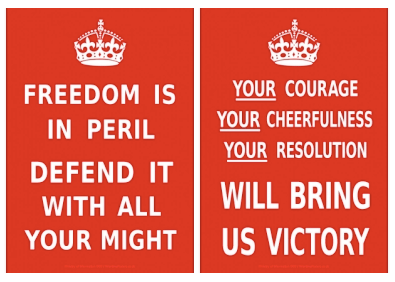 But before it became a meme it was infact a WWII British propaganda poster, that had never been distributed during the war..
“The “Keep Calm and Carry On” poster was first commissioned in 1939 by England’s temporary Ministry of Information. Similar to the previous two posters issued by the government, “Freedom Is In Peril. Defend It With All Your Might” (400,000 printed) and “Your Courage, Your Cheerfulness, Your Resolution Will Bring Us Victory” (800,000 printed), “Keep Calm and Carry On” was intended to be distributed in public places to strengthen morale in the event of wartime emergency, which was considered inevitable at the time. Thank you to Melody Tolson who posted the fantastic “Keep Calm and Carry On” video link to my FACEBOOK wall yesterday…it is quite delightful. This entry was posted in Uncategorized and tagged keep calm and carry on. Bookmark the permalink. ← The most minutes, win it! The stock of original posters more than trebled recently – a recent episode of Antiques Roadshow showed a lady with a collection of about 20, some in good condition. She was staggered by how rare they were. Slogan has become very fashionable of late. I have just viewed an advert for a CD of chill out tunes on sale at Tesco with similar theme. Even found one with Keep Calm and Crochet. I love your blog and I am amazed at all of the new things I learn. Have not been on much lately but checked our your kiddies choc biscuits recipie and will attempt them tomorrow. So looking forward to them, I too am starting out again on a vegan diet, moral and health reasons and I have found lots of valuable advice in your blog. I would love to follow a wartime diet, so here goes my 2nd attempt, will try to get organised so wish me luck. Do you have a list of the points system for tinned goods etc. I am curious to find our exactly what you could buy with your 16 points. Well done on your weight loss so far, and wishing you huge amounts of success for the future. Was so gobsmacked at your photos, can’t believe how much your have changed. Woo-hoo you and a big well done.